What is your age, and how long have you been training with Melbourne Pack? 41 and I have been with Melbourne Pack since October 2017. What are your personal best running times? Tuesday, Thursday and Sunday mornings. Greg Watson has an outstanding ability of being able to encourage you while running and his encouragement does spur me on. Otherwise, chasing the likes of Rohan Day, Sean Verwey and Nick Jansen is a challenge I enjoy accepting each session. The name Alexander Gibson will be among those names soon enough. I finished the 2016 Adelaide Marathon in 3.44:53 and recall saying to my support crew (which consists of my wife, Angela) that I didn’t think I could go much faster. Early in 2017 I started gym work and getting some better km’s in and improved to the point where I ran a 3.07:26 in 2017. At that point, I was just able to sneak under 19.00 for a parkrun. I’m now at a point where I have run an 18.10 and can at least be around the better runners at Chelsea Bicentennial Parkrun. I used to see the #8 finishing token regularly and now it’s seemingly the #4! 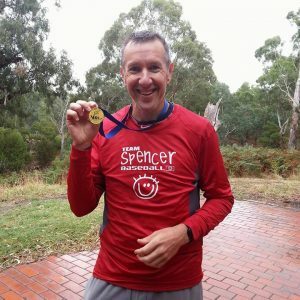 2017 Adelaide Marathon. To run a 37+ minute PB and finish fourteenth was a massive shock and I felt a great reward for the effort that I had put in over the dark winter nights both on the roads and trails and in the gym. Who is your favourite runner and why? Coming from another sport, I’m somewhat blissfully unaware of many of the ‘names’ domestically and internationally. I couldn’t tell you who won the Olympic marathons, or any of the other big events, and I really like it that way. Brett Gardner, an outfielder for the New York Yankees. He’s not a big hitter like some of his teammates, however over 162 games in a season he’s the type of player you know will be giving you 162 games of full energy, passion, hustle and desire. That’s an attitude I can admire very easily. Will we ever see you in a running singlet? Everyone seems really keen on seeing my T-Shirt tan. Short term, to break the three hour mark for the Adelaide Marathon. To think that after running a 3 hour 52 minute time in 2015 I can contemplate such a goal is something I do not take for granted. I haven’t looked that far ahead after Adelaide, however I’d like to do a few team events as I enjoy a team environment and sharing in team success. All positive, though I may not be thinking it during some sessions when I’m working hard. The sessions are always challenging, but never to the point where the goals and objectives of the session are unobtainable. No matter what the conditions, we’re running and at times, he may change something up during a session – just to take you out of your comfort zone. It may seem harsh, but it isn’t. What happens if something unexpected occurs with a few KM to go in an event? The sessions are not only great preparation for the body, but the mind as well. Very much so. Sean has the admirable quality of being able to have twenty people of different shapes and sizes in a session, all with different running goals and objectives, yet is able to tailor the session to ensure everyone is given achievable outcomes for the session. No matter what your goal is, he will give you a program that is challenging throughout, and while it has your long term goal in mind, you’ll also have some great markers throughout to assist tracking your progress. You’ll also have a great group to work with. One thing that has been evident from day one is the camaraderie within the group. We’ll challenge each other, but celebrate each others achievements along the way. If there is a jealous soul at MelbournePack I’m yet to notice it. You are a top local baseballer. What are the similarities and differences between competing in these two sports? Really need to get rid of the word ‘top’ from that question. 😉 The two are largely different for mine. Baseball is a sport that largely involves short bursts of energy surrounded by (sometimes long) periods of downtime (except for the pitcher and catcher). Running is that longer, sustained effort that involves little to no downtime throughout the event.